Toyota has released the ultimate "all-seeing" Land Cruiser 200 Series - a top-of-the-line Sahara with innovative camera applications that make it easier than ever to perform manoeuvres from off-road driving to parking. Drivers can now obtain a panoramic view around the Sahara using four cameras - front, rear and in the side mirrors - to provide added confidence with the placement of wheels, both when moving forward and reversing. These clever features, particularly useful in tricky off-road situations, have been adopted as part of wide-ranging advances to the legendary Land Cruiser 200 Series range that cover everything from styling to performance and safety. As the premier model, Sahara adopts advanced safety features that include a pre-collision system, dynamic radar cruise control, lane-departure alert, and blind-spot monitor with rear cross-traffic alert. These are in addition to standard safety features across the range that include seven airbags, vehicle stability and active traction control, multi-terrain anti-skid brakes, hill-start assist control, trailer sway control, an emergency brake signal and tilt/telescopic adjustments for the steering column. 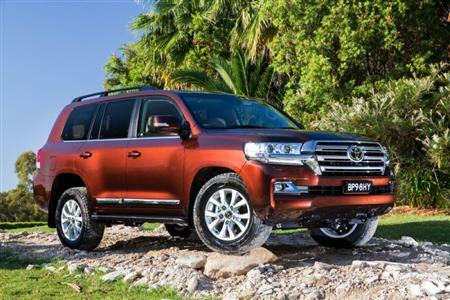 Updates for Land Cruiser's V8 engines - the 4.5-litre twin-turbo diesel and 4.6-litre petrol - bring improved fuel economy and Euro 5 emissions. Diesel power has increased by 5kW to 200kW due to new injectors and revised mapping while torque remains at 650Nm. Combined cycle fuel consumption rating also benefits, and is now just 9.5 litres/100km, an improvement of 7.7 per cent. Along with the addition of a particulate filter, CO2 emissions have improved to 250 grammes/litre. Economy and emissions for the 227kW, 439Nm petrol engine have improved to 13.4 litres/100km and 309 grammes/km, gaining from the adoption of secondary air induction through the exhaust ports for faster catalyst warm-up from a cold start. All models receive more modern and aggressive styling with a new grille, headlamps, bumper, bonnet and mudguards at the front, and a restyled rear that includes LED tail lamps. 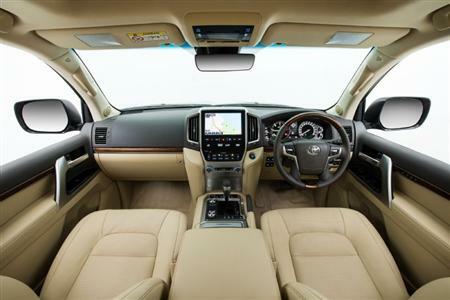 Upgraded interiors for grades above GX include soft padding around the centre console in areas that come in direct contact with occupants' legs. The Land Cruiser 200 Series line-up remains diesel-only GX, followed by petrol or diesel GXL, VX and Sahara, all driven through an electronically controlled six-speed automatic transmission. GX is trimmed with grey fabric and GXL with grey or beige fabric while VX and Sahara offer the choice of black or beige for their leather-accented interiors. GX is a five-seater, diesel VX and Sahara have seven seats and all other grades offer eight seats. Newly designed headlamps are halogen on GX, projector on GXL with LED low and halogen high beams with static auto-levelling; and dusk-sensing Bi-LED for VX and Sahara with dynamic auto-levelling. The two higher grades also feature LED front fog lamps. As the entry model to the range, GX also gains a 12-volt accessory socket in addition to its 17-inch steel wheels and snorkel. Its use as a workhorse is reflected in features that include vertically hinged rear door and vinyl floor covering. New GXL features include roof rails, LED low-beam headlamps with auto-levelling (static), LED clearance lamps, leather-accented steering wheel and gear-shift knob, a revised analogue instrument cluster and variable intermittent wipers (front and rear). Other GXL features include 17-inch alloy wheels, dual-zone front climate-control air-conditioning, a rear cooler, rear spoiler, aluminium side steps, a second 12-volt connector and a 220-volt rear connector, horizontal-split tailgate, smart entry and start, reversing camera, satellite navigation, privacy glass and body-coloured mirrors. VX steps up with new features that include dusk-sensing bi-LED headlamps that incorporate dynamic auto-levelling. It gains side airbags for the outboard second-row seats as well as LED front fog lamps and daytime running lamps, newly designed Optitron instruments with a 4.2-inch colour multi-information display and a nine-inch touchscreen display (one inch bigger). Other standard VX features include leather-accented seats, 18-inch alloy wheels, rain-sensing wipers and the Kinetic Dynamic Suspension System - originally developed in Australia. Other comfort and convenience items include front and rear parking sensors, power-retractable exterior mirrors, moon roof, black side steps and woodgrain-look interior highlights. At the top of the range, Sahara - in addition to the new safety equipment and other features shared with the VX - gains a wireless smartphone charger and revised back-seat entertainment with screens mounted on the back of the two front seats. It is also uniquely equipped with a power tailgate, heated electric side mirrors, multi-terrain monitor, a cool box, heated front and second-row seats, ventilated front seats and active head restraints. Its electrically adjustable steering column has three memory positions that also incorporate seat and mirror positions. 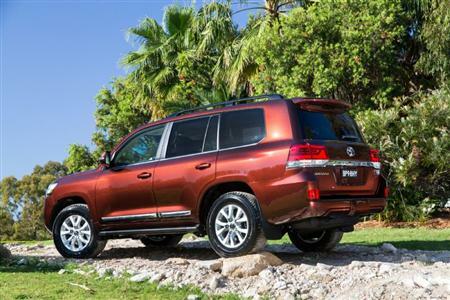 Upgraded Toyota Land Cruiser 200 Series is priced from $76,500* for the GX turbo-diesel. Price changes are below 2.6 per cent for petrol models and between 3.9 and 4.3 per cent for diesel.